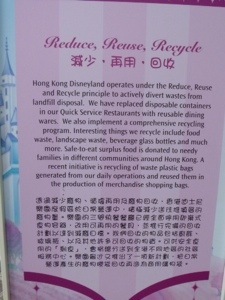 There is a very obvious environmental awareness theme going on at Hong Kong Disneyland and no doubt more widely in the Hong Kong community. A number of times at Hong Kong Disneyland, we had to wait in line at the water fountains as locals filled up their reusable water bottles. This is something we always do. Yes, the water tastes like it came out the pool but its not going to make you sick and its much better for the budget and the waist line than drinking soft drink. Way to go Hong Kong! Also noticeable at HK airport are the signs for Meat-Free Monday – good to see! Even better! I am a vegan struggling to find options while traveling and eating out. I didn’t find it difficult to find vegetarian food in HK – we found a lot of Indian restaurants which would always be a good vegan choice. There are a few vegan/vegetarian places around, I found an app called Vegetarious in the App Store for my iPad which shows you which vegetarian restaurants are in the area. Also when i asked, the word “vegetarian” was understood – much better than in South America where “vegetarian” seemed to mean “comes with ham”.